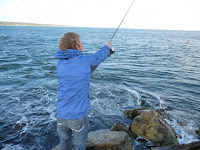 "I'm a longtime fisherman -- first freshwater bass, then trout on flies, then stripers and blues from the surf -- which is what got me thinking about fishing the striped bass and bluefish derby on Martha's Vineyard. I'm also a writer, and I love reading stories about subcultures obsessed with ... well, whatever: extreme beer, orchids, the Civil War, high school football, Scrabble. I put those two things together and ended up with the formula for my first book. In 2007, I spent two months on the Vineyard fishing in and documenting the derby, probably the most celebrated striper fishing tournament anywhere. It's got sixty-odd years of rich history, and anybody can win the thing: a 12-year-old girl caught the big striper one year. I entered the derby myself and caught a few fish (my best striper weighed in at 17 pounds) but I was really after stories. It took some work getting islanders to let me follow them around while they fished. This is a cagey group under normal circumstances, and when you put them into a competition with island immortality and more than $250,000 in prizes at stake, they can get a little paranoid. Eventually I won their trust, and I went out at all hours with people who take the sport way, way more seriously than I ever have. During the tournament, people will skip out on work, stay up all night for weeks on end, risk drowning, cheat and (of course) lie. I lucked into being there for one of the more interesting derbies. The best young striper fisherman on the island, Lev Wlodyka, got a 57-pound bass -- topping a 56-pounder caught earlier in the contest -- but when he brought it to the weigh station, the derby officials discovered it was filled with lead weights. Controversy ensued: heated debates broke out, the public weighed in, Lev wrote a spirited letter in his own defense. I won't spoil the book by telling you what happens, but the whole thing made for a fun story to tell. It's definitely a different sort of fishing book. It focuses less on man-versus-fish, or the contemplative pleasures of going off into the wilderness and connecting with nature, and more on the communal aspect of fishing. Competition is always there in fishing -- guys want to catch the biggest fish of the day, or a better fish than their friends, or a fish they can brag about to their family. By telling the story of the derby, I tried to bring that to life. I hope people have as much fun reading it as I did bringing it to the page."